While 2017 was undoubtedly a huge year for education in national politics and in Los Angeles, 2018 has the potential to bring big changes to education across California. A new governor, who will appoint a new state Board of Education, will have a significant impact on how education is funded and what students are learning. Here are seven things to be looking for in 2018 and how they will shape education policy in the years ahead. 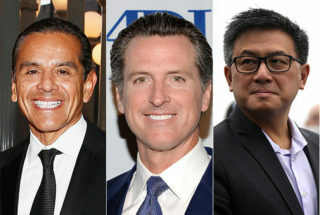 1. Who will be California’s next governor? Education is shaping up to be a major issue in the 2018 gubernatorial race as it’s an area where the four top Democratic candidates differ. Lt. Gov. Gavin Newsom, who is leading in early polls, has been endorsed by the California Teachers Association and the California Federation of Teachers and is seen as a candidate who supports the education establishment. Newsom said he believes one of the most pressing issues in education is the “crisis” of demoralized teachers. Former LA Mayor Antonio Villaraigosa has the ardent support in the school reform community, which believes he pushed for public charter schools and more accountability in the nation’s second-largest school district with little political upside and clear risks. As mayor, he attempted to take control of LA Unified and supported Vergara v. California, which challenged teacher tenure laws. On the campaign trail, he has said that the system of education in California is “broken.” State Treasurer John Chiang’s views on education are less known, but he didn’t support the Vergara lawsuit. Delaine Eastin, a former state superintendent of public instruction, has called for a moratorium on charter school growth. She also said the state needs to address the demoralized teaching profession. All four candidates said they supported Gov. Jerry Brown’s major education policy that reformed how the state funds education, called the Local Control Funding Formula, which gives more money to districts with high numbers of English learners, low-income students, and students in the foster care system. The primary election is June 5, and the two top vote-getters will advance to the general election on Nov. 6. The governor also wields significant power each year when it comes to education funding. School districts are largely funded by the state through a per-pupil allocation that is based on daily attendance. The governor, with the approval of the Legislature, determines the per-pupil allocation as he is developing the budget each year. The LA Unified school board, along with labor unions and the wider education community in Los Angeles and statewide, are calling for the state to increase per-pupil funding to $20,000 by 2020, which would nearly double the state’s allocation for education funding. The governor also wields significant influence by signing or vetoing bills. Legislation already in process includes Assemblymember Shirley Weber’s AB 1220 extending the probation time for teachers before they are granted tenure. Education advocates are also looking to address the teacher shortage and for more transparency and accountability on where state funds are spent. 2. How will the governor’s race affect the state Board of Education? Whoever becomes the governor in November will appoint 11 members to the state Board of Education, which has the authority to set education policy. The board determines what textbooks will be used, academic standards for each subject, accountability standards for schools, and curriculum frameworks. After removing the Academic Performance Index (API), which had rated schools using a single score based on test results, the board spent years creating a new evaluation tool. Last year it launched the color-coded and oft-criticized Dashboard, which includes a variety of ways to measure schools but does not use a single score or grade to easily compare schools. The board also authorizes 22 charter schools around the state. The state Board of Education is also in charge of implementing the new federal education law called Every Student Succeeds Act, or ESSA. The state approved its plan and submitted it to the federal government in September. In late December the U.S. Department of Education gave its initial feedback and asked for substantive changes to the plan, which must be addressed by the state Board of Education. The board has not yet identified how it will identify the bottom 5 percent of schools. It must begin to implement the accountability system under ESSA in the 2018-19 school year. 3. Will Marshall Tuck prevail in his second run at state superintendent of schools? Also on the statewide ballot is the race for the superintendent of public instruction. Incumbent Tom Torlakson cannot run due to term limits, so the race is an open contest between Marshall Tuck and state Assemblyman Tony Thurmond. Tuck, who used to lead Green Dot Public Schools, a charter school network in LA, and the Partnership for Los Angeles Schools, a nonprofit organization formed by Villaraigosa that runs 19 LA Unified schools and seeks to improve the low-performing campuses, ran four years ago and narrowly lost to Torlakson. That race was the most expensive on the ballot that year. Tuck is supported by the education reform community and charter school supporters. Thurmond, who represents the East San Francisco Bay area, has been endorsed by the California Teachers Association and U.S. Sen. Kamala Harris. 4. Will California’s ESSA plan be approved? The state Board of Education is in charge of implementing the federal education law called the Every Student Succeeds Act. The law signed by President Barack Obama in 2015 gives states much of the authority to hold schools and school districts accountable for student success and to implement standards and assessments. Each state must submit plans that detail how they will comply with the law to the U.S. Department of Education, which must approve each plan. The California Department of Education submitted its plan to comply with the law in September and received its first feedback at the end of December, asking for substantial changes. Advocates have criticized the state’s plan saying it doesn’t go far enough in detailing how the bottom 5 percent of schools will be identified for extra help. ESSA requires that states identify which schools are among the bottom 5 percent in performance and intervene to provide those schools with extra support. 5. Will LCFF finally be fully funded? School districts are anxiously awaiting the release of the governor’s proposed budget in January. Some are expecting that the governor will fully fund the Local Control Funding Formula, which he created in 2013-14, that gives school districts more flexibility in spending and allocates more funds to districts with larger numbers of low-income students, English learners, and students who are in foster care. LCFF is expected to be fully funded in the 2020-21 school year. However, Gov. Jerry Brown could choose to speed up that timeline and fully fund it this year before he leaves office. This year LCFF is at about 97 percent funded. All of the leading candidates for governor have said that they support LCFF and will continue it if they are elected. 6. Are California’s rising graduation rates for real? High school graduation rates locally and nationally hit record highs in 2017. The graduation rate for LA Unified’s Class of 2017 was 80 percent, and Superintendent Michelle King has made 100 percent graduation her goal — a feat not achieved by any urban school district. In LA Unified, graduation rates have been bolstered by a $15 million credit recovery program to help students who have failed classes earn enough credits to graduate. The rigor of the online courses as part of the credit recovery program has been questioned because students can pre-test out of taking the course and earn credit. Some LA Unified school board members want to raise graduation requirements to require at least a C in college prep classes, undoing a vote of the previous board to lower the requirement to a D. For the Class of 2016, less than half of graduates were eligible for the University of California and California State University systems, which require a C in those classes. 7. How will LA deal with its problem of chronically absent students? Under the new California Dashboard, schools and school districts will now be evaluated for how often their students attend class. A student is considered chronically absent if he or she misses 15 or more days of school. Schools also have a financial incentive to improve attendance rates, as state funding for schools is based on daily attendance. Chronic absenteeism in LA Unified increased by 1 percent last year, despite a focus on improving attendance. That decline cost the district $45 million in state revenue. A new task force spearheaded by philanthropist and former L.A. Times publisher Austin Beutner and King has made attendance its first area of focus. The district will start to implement the task force’s recommendations this year, including a social media campaign directed at telling parents the importance of sending their children to school every day.